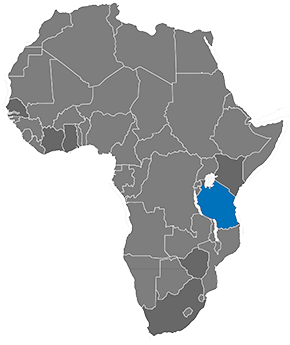 Tanzania is in East Africa, and its capital city is Dodoma. Its largest city and economic hub is Dar es Salaam. When we use the term disability, we mean impairments like cleft lip/palate, obstetric fistula, cataract or an amputation. These impairments can either be developed ‘in utero’ (during pregnancy), or as a result of a trauma (e.g., a fire, a road accident or during a complicated childbirth). These impairments can restrict a person’s mobility, vision, and nutrition, and put them at risk for wider health complications. People living with an impairment in Tanzania can also struggle to complete their education or secure employment. The good news is these impairments can often be corrected with surgical or medical treatment. When the impairment is permanent, physical rehabilitation can often improve a person’s mobility and increase their independence. Why does your maternal and newborn healthcare program only focus on Dar es Salaam? Dar es Salaam is Tanzania’s largest city, and one of the fastest growing in East Africa. The current healthcare system is unable to cope with the current demand on its services, resulting in overcrowded labor wards, overworked staff and a shortage of vital equipment and supplies. Thousands of women and babies die in the city every year as a result of sub-standard care during pregnancy and childbirth. Immediate action needs to be taken to ensure that the mothers and babies of Dar es Salaam do not become another statistic. While many maternal and newborn healthcare programs focus upon addressing the unmet need for maternal healthcare in rural areas, we focus on the unique urban challenge that is putting the women and newborns of Dar es Salaam in grave danger. What is the government of Tanzania doing to solve these problems? The Government of Tanzania has made its own financial contributions to CCBRT’s work on the ground, including donating the land on which CCBRT’s hospitals are built and contributing to medical staff salaries, medicines and consumables. This relationship was formalized in 2007 through the establishment of a Public Private Partnership with the Government of Tanzania. Why should I donate to Kupona, and not directly to CCBRT? By donating to Kupona you become part of our collaborative ecosystem of supporters, gain access to our regular updates, invitations to our events, and a guarantee that our U.S. based team will be able to track your donation and measure your impact. Kupona is a 501(c)(3) registered non-profit, which means that if you are a U.S. taxpayer you can claim tax relief on any donations made to Kupona to the extent allowed by law. Kupona means ‘to heal’ in Kiswahili, the national language of Tanzania, reflecting our commitment to providing access to high quality care for people and communities living in poverty in Tanzania.